The month of April is lambing season at the University of Maine. Students in the Ewe Maine Icelandic Sheep Club birth all lambs born at the Witter Teaching and Research Center on campus. The sheep club allows students to get first-hand experience assisting the birth of the lambs. The Sheep Club has assisted female sheep, known as ewes, with 23 births so far this season. Ewes can give birth at any time so members of the Sheep Club watch a live feed camera in the barn to monitor when the sheep show signs of labor. One person is always nearby to tend to the sheep. James Weber, an Associate Professor in the School of Food and Agriculture and the attending veterinarian for UMaine, is the advisor for the Sheep Club and says he takes a “hands-off” approach when allowing students to learn about the sheep. He trusts club President Jaime Boulos and Vice President Kyle Alamo, who are both Animal Veterinary Science majors with a concentration in Pre-Veterinary Medicine, to teach club members about how to care for the sheep. He allows Boulos and Alamo to oversee the lambing (the birth of lambs), and remains on-call for any difficulties. “Kyle and Jaime have actually been there for, I think every single lambing [this season]… they mentor the students who haven’t done this before,” he said. 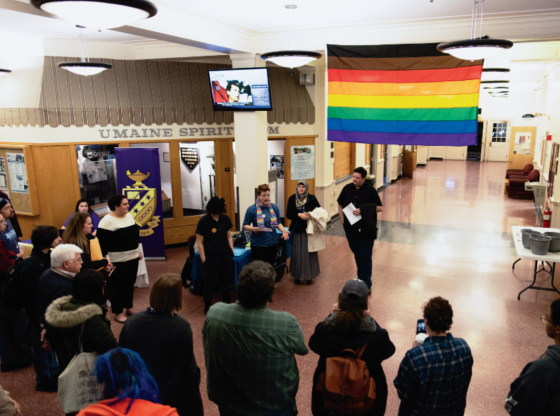 Boulos is a fourth year and Alamo is a third-year student who have been members of the Sheep Club for almost the entire duration of their time at UMaine. They have assisted with multiple lambings since they’ve entered the club and are now helping others learn how to lamb. “Our role is to take what we’ve learned and pass it on, so people can continue on [learning how to lamb],” Alamo said. They treat every club meeting like a lab. The Sheep Club has a list of competencies they teach students, which consists of learning how to feed, catch, vaccinate, do veterinary exams upon, artificially inseminate and birth lambs. Students are taught how to care for the sheep using different equipment and fertility methods. There are 21 Ewes and two rams. Students artificially inseminate some of the ewes and allow the rams to breed with other ewes. Once the ewes are inseminated they use ultrasound technology to monitor the lambs while in utero. 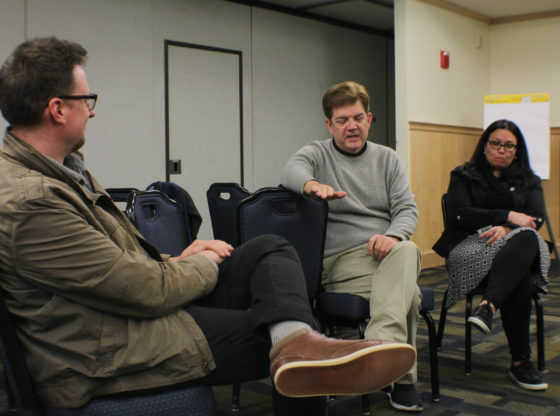 “I think it facilitates student learning,” Boulos said. Multiple students who participate in the club while at UMaine have expressed a desire to come back after graduation and buy sheep from UMaine to raise and care for on their own, according to Alamo. Shannah Duffy, a third-year Animal Science major with a concentration in pre-veterinary studies, participated in the lambing for the first time this year. She had many opportunities to learn about lambing in club meetings and was able to shadow births before she assisted with one herself. When she was assigned a sheep to watch for labor earlier this season she said there was a lot of suspense building up to the birth. She was able to apply what she was taught in meetings and classes to a real life birth, which gave her a deeper understanding of what she was learning. “We’ve learned about pregnancy and birth in lots of our classes but once you actually see it put together and you actually have to know the anatomy and how stuffs supposed to come out and how to get [a lamb] breathing, I think that’s where it kicks in and and that’s where I start to remember things,” Duffy said. The sheep came to the campus as a donation from Frelsi Farm, operated by Elaine Clark in southern Maine, for a research grant to study parasites and vaccines in the fall of 2014. The sheep have since been used as tools for learning in other ways. Weber said UMaine will transition the sheep from a research flock to a teaching flock if they don’t get another grant. Sheep are an economic animal to own. Weber said selling the lambs and wool almost covers the whole cost for feeding the animals. “You get a lot of teaching in for the money,” he said. The lambs at UMaine are most commonly sold to fiber farms for breeding, wool and some milking. The best time to visit the lambs is between 11 a.m. and 1 p.m. during the week. The sheep club welcomes students from all majors to join. They meet every Friday at 2 p.m., anyone interested can email James Weber.